To improve motorcycle safety many countries mandate the wearing of personal protective equipment such as protective clothing and helmets. Protective clothing may include certain types of jackets, gloves, boots, and pants. Jackets meant for motorcyclists are typically made of leather or specialized man-made fabrics like cordura or Kevlar. These jackets typically include heavy padding on the elbow, spine, and shoulder regions. 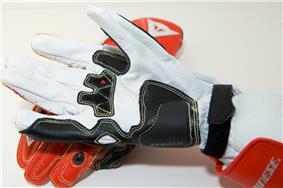 Gloves are generally made of leather or Kevlar and some include carbon fiber knuckle protection. Boots, especially those for sport riding, include reinforcement and plastic caps on the ankle and toe areas. Pants are usually leather, cordura, or Kevlar. 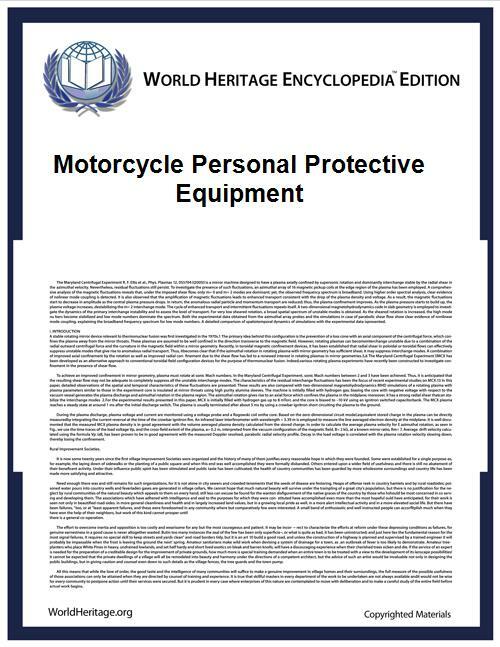 Except for helmets, none of these items are required by law in any state in the USA, or in any part of the UK but are recommended by many of those who ride. "Off road" riders wear a range of plastic armour to protect against injury from falling off, hitting other riders and bikes, debris kicked up from the rear wheel of leading bikes, and from running into track barriers protecting the public. This armour protects the extremities from breakage and dislocation and the back and chest from strain and broken bones. Although fairly efficient, it is of course not always completely effective. 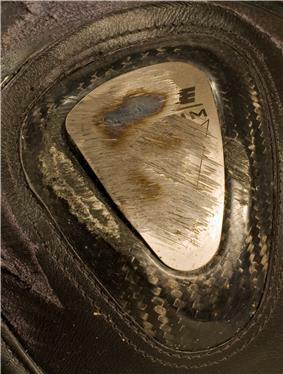 Many riders wear "roost protectors" designed specifically to protect against painful debris from other bikes, but are of no use in a fall or collision. 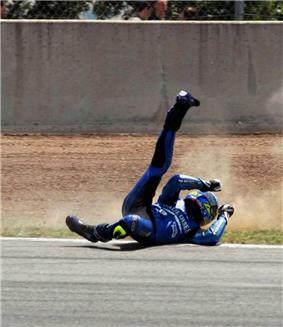 Shoulder panel of motorcycling racing suit after a 150 km/h (94 mph) crash. The rider escaped unharmed. 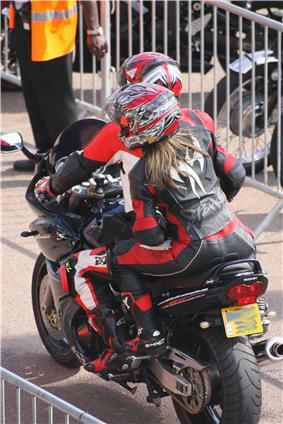 Leathers are one-piece suits or two-piece jackets and trousers worn by motorcyclists mainly for protection in a crash. The leather used is not fashion leather but protective leather which is thicker and stronger, and only moderately flexible. Today, kangaroo leather is becoming popular for its suppleness, light weight and strength compared with cowhide. Leather suits were the first motorcyclists' garments to be tested and approved to the Cambridge Standard, the forerunner of European Standard EN 13595-1:2002. Originally, motorcycle leathers were adapted from tank corps gear immediately following World War I. Duster coats, which tended to catch in the wheels, were switched for short coats. Wide-pegged breeches were worn by some motorcycle police and by dispatch riders in World War II. The classic American Perfecto motorcycle jacket with epaulets and diagonal zipper, made famous by Marlon Brando in The Wild One, (1954) was invented in 1928 by Irving Schott, of Schott NYC in New York City. Leather chaps, adapted from cowboy gear, were used by American bikers starting in the early 1960s. The one-piece racing leather suit, usually referred to as 'racing leathers' was first used by world champion motorcycle racer Geoff Duke in the 1950s. Duke had the suit made for the purposes of streamlining, not safety, and like the majority of the leathers used at the time, was made from horsehide. Many modern leathers have armour on the inside at major impact regions such as shoulders, elbows, hips, knees and back. The European Standards for these protectors are EN 1621-1:2007 and EN 1621-2:2003. The energy absorbers and load spreaders — constructed from high density foam, foam backed hard polymers, carbon fiber, titanium, and other materials — are designed to prevent or reduce injury by spreading and dampening impact and shear strains to the wearer. In Europe, by law, armour has to have a CE mark. There are also motorcycle jackets that use an airbag system, which deploys in the event of an accident, inflating to protect the riders neck, torso, and lower back (see also Airbag). An alternative to leather is clothing constructed of man-made textiles. These can offer improved weather protection from heat, cold, and water, and the increased utility these garments tend to provide in terms of pockets and vents. Common materials include high density (600–1000 Denier) ballistic nylon (e.g., Cordura) and Kevlar, or blends of Kevlar, Cordura, and Lycra; and often include waterproof liners made from materials such as Gore-Tex. In both CE marked (meets European Standards) and non-protective garments, localised protection may be provided by armour and airbag systems. Not all textile clothing is made from synthetic materials. Heavy weight waxed cotton was used for many years before the development of modern materials. Textile jackets and trousers, tested and CE approved to European Standard EN 13595-1. 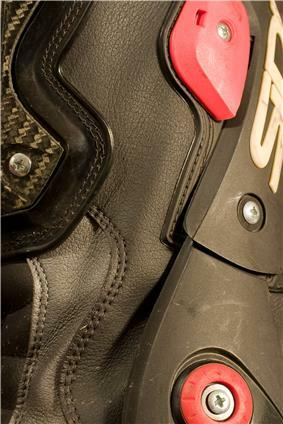 Boots are worn by motorcycle riders and passengers to prevent or reduce harm to their feet and ankles while riding and in the event of a crash. They are designed using materials and seam construction that are impact, abrasion, cut, tear and burst resistant. Tough, strong, moderately flexible boots with stiff soles provide the rider protection from a number of risks. Boots with oil-resistant, rubber-based composite soles give a grip on the pavement and help keep the rider's feet on the pegs. Boots may also have energy absorbers and load spreaders on the shin, inside and outside of each ankle. A stiff sole working laterally helps prevent or decrease crash injuries caused by crushing and shear strain. For boots, the European Standard is EN 13634:2002. Armour increases the chances of a motorcyclist surviving an accident. The most common form of armour is high density foam panels fitted into the shoulders, elbows, back, hips and knees of motorcycle PPE clothing. Separate protectors are also available, typically for the chest and back, which are worn under other items of clothing. A motorcycle helmet is protective headgear used by motorcycle riders. The primary goal of a motorcycle helmet is to protect the rider's head during impact, although many helmets provide additional protection such as a face shield. 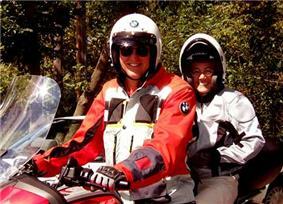 In many countries the wearing of motorcycle helmets is mandatory. Helmets are made in two main layers: hard and energy-absorbing. The hard shell spreads an impact over a larger area, while deformation of the liner (often polystyrene foam) absorbs energy so less is transferred to the skull and brain. There are three main styles: flip-face, open-face and full-face. An open-face helmet will protect everything but the face. Full-face helmets protect the skull, plus providing protection for the lower jaw as well as the face itself. Full-face helmets offer much more protection than open-face helmets. Several manufacturers have introduced full-face helmets with a flip-up front, combining the protection of a full-face with the ease of communication and donning or doffing that an open-face gives. As with other protective gear, a brightly colored helmet improves the user's visibility. Motorcycling gloves are typically gloves made of leather. They may have gauntlets to protect the rider's wrists from injury, and help reduce drafts while riding in colder climates. Motorcycling gloves typically have reinforced palms intended to protect the rider from abrasion injuries in case of an accident. Again, if the manufacturer claims the gloves are protective, then they must be CE marked. European Standard EN 13594:2002 is available for this purpose. Optional features include additional protection or weatherproofing. For touring gloves, such additional features may include advanced insulating materials and waterproof breathable fabric, although touring gloves may still lack advanced armouring features used in motorcycle racing gloves. Gloves intended for motorcycle racing typically incorporate pre-curved finger sections and the best available protection, obtained through additional armour incorporated within the glove. 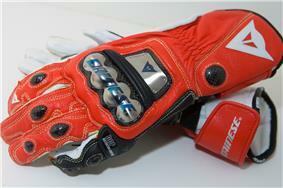 Additional protection may involve titanium or carbon panels for knuckles and the joints of the fingers. Furthermore, racing gloves may and often do incorporate additional wrist and other protection panels to protect the heel of the hand, back of the hand and other easily injured parts of the hand. ^ Andrew Mellor, Advanced Motorcycle Helmets (PDF), NHTSA, retrieved 2012-10-06, A helmet is designed to protect the rider in the event of an accident by absorbing impact energy and reducing the loading imparted to the head via the helmet. ^ "Helmets for preventing injury in motorcycle riders". Center for Advancing Health. 2008-01-23. ^ "Q&As: Motorcycle helmet use laws". Insurance Institute for Highway Safety.